Simha (Sanskrit सिंह) is ancient word of Sanskrit language which means lion or a powerful one. Simha also refers to a tune, mythical bird and a zodiacal sign. Reference of Simha is found in Vishnu Puran as a form of Lord Vishnu in which he is the destroyer of sins of devotees when they merely remember him. Mention of this name is also found in Riga Veda (ऋग् वेद) in which Simha signifies the powerful one. Simha also founds to be referenced in Markandey-Puran (मार्कण्डेय-पुराण) and Varah-Mihir-Brihat-Sanhita (वराह-मिहिर-बृहत्-संहिता) as the zodiacal sign Leo. Simha is also mentioned in the Mahabharata (महाभारत) and Kavya literature where Simha is used for a hero or an eminent person who expresses excellence of any kind. Simha finds mention in Bhagavata Purana where Simha is the name of a son of Krishna (कृष्ण). Simha finds mention in Kathasaritsagara where Simha is the name of a king of the Vidyadhars (विद्या-धरs). Mention of Simha (सिंह) is found in the Ramayana where this word refers to a mythical bird. 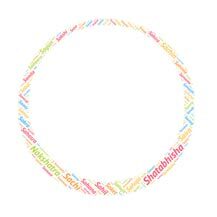 According to the chart shown above, Simha is not a popular name in the USA. Simha is a very popular name in India as it another name of Lord Vishnu. Surprisingly Social media records show that, Simha is adopted by only 107 people in India. Simha is a short and stylish name and Simha also has a great sort of mythological significance attached to it. Simha, is a Telugu movie. Simha Bhagavatula, an award winning playback singer from Telugu Film Industry. Bobby Simha, is an actor. Simha Gharjane is a 1983 Indian Kannada film. Simha rashi is also known as Leo in Latin. It represents lion and the personality traits of people born under this rashi are similar to that of lion. Sanskrit name Mohin literally means 'attractive, deluding'. ..
Sanskrit girl name Nagini (Sanskrit नागिनी) literally refers..
Means "prowess,heroism and courage" in Sanskrit.It is anothe..
Sanskrit Name Atmaj (Sanskrit आत्मज) literally means origina..